Happy Easter! I have made another flavor of rum cake to take to mom's for Easter dinner. Not that we will need another dessert as I know there will be lots of goodies to be had! If you follow me on Instagram make sure to check in and I will post some pictures of all the goodies we have today. 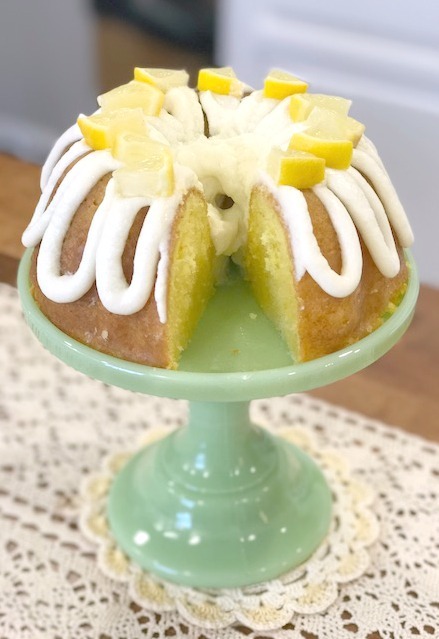 In this lemon variation of rum cake I have used a lemon cake mix, added lemon jello and lemon pudding to the cake... the icing has fresh lemon juice added so this cake is very lemony! 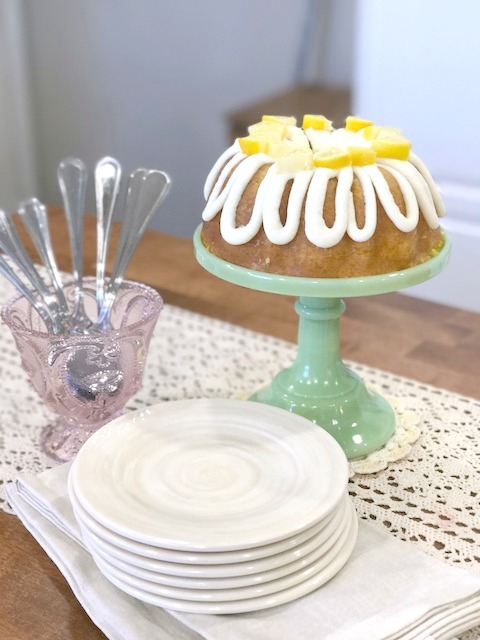 Since I know there is going to be plenty of desserts to try at mom's I decided to use a 6 inch bundt pan and my 6 inch Mosser Glass cake stand. I love how this cake fits perfectly on my stand. 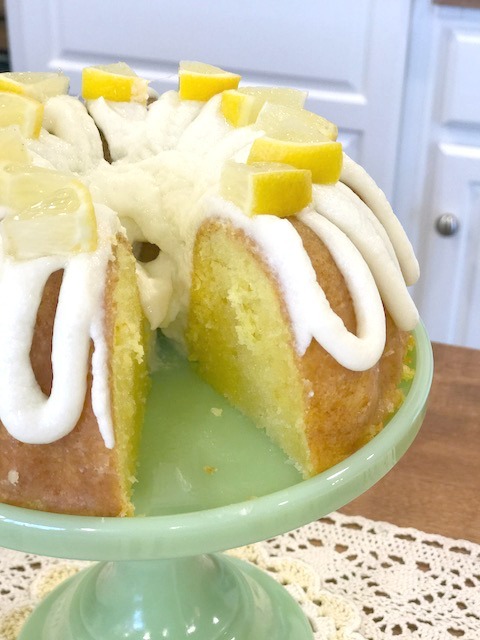 I have halved all the ingredients for this 6 inch bundt pan, if you should be using a regular bundt pan just double everything and bake for about an hour. 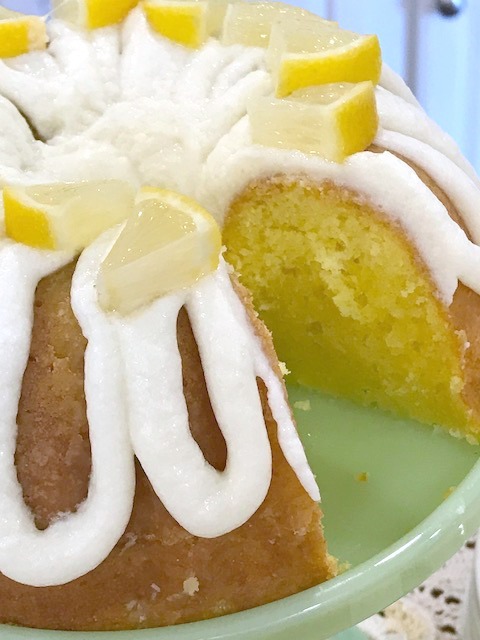 As many of you already know, Lemon is one of my all time favorite flavors.... I love lemon anything! In picture above you can see where the buttery rum glaze has soaked up into the cake. 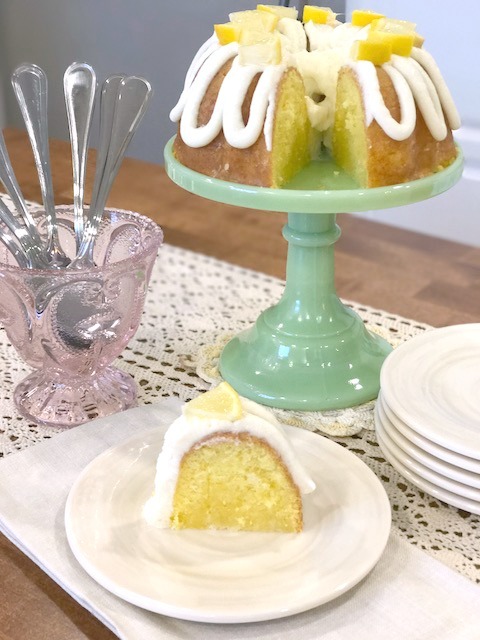 This bite of cake is my favorite, it is gooey, buttery and really moist! I guess you would call it the sweet spot. 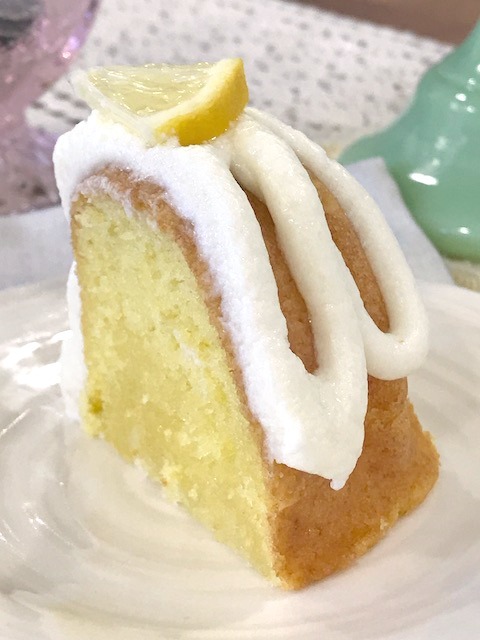 The icing is made a little thicker than just a glaze so that I could pipe pretty swirls down the sides of the cake and then top it off with pretty little lemon wedges. Grease and flour 6 inch bundt pan. Combine all ingredients and mix together for 2 minutes. Pour into 6 inch bundt pan, bake for about 35 minutes. My cake did fluff up above the top of the pan, since I wanted it to fit on my 6 inch cake stand I did trim the bottom of my cake off. The cake was so good warm even without any icing! Mix and boil 3-4 minutes. Reserve 2 tablespoons butter rum glaze to use in the icing. Pour the remaining butter rum glaze over the hot cake (while cake is still in the pan) Let cool about 20-30 minutes, remove cake from pan and place on serving dish. Mix everything until icing forms, add more powdered sugar if not firm enough. If desired place icing in a bag with a Wilton decorating tip #10 and loop the icing up and down the sides of the cake. Garnish with fresh lemon slices.